Are you planning a party but want to make sure that you have full creative control on your invitation card’s design? If yes, check out these blank invitation card templates that we have curated for that specific purpose. In this article, we offer pieces of advice on how to select a good blank invitation card design and why it makes sense to use pre-made card templates for creating them. This article is also filled with examples of blank invitation card templates that anyone can download and transform into something new for their upcoming party or event. 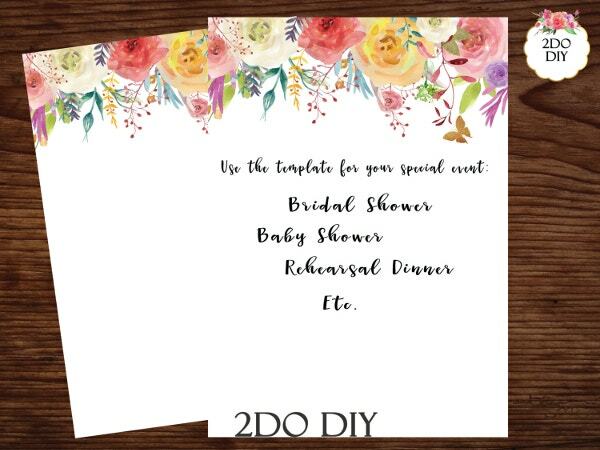 Embedded below are downloadable examples of blank invitation card templates that anyone may use for whatever event you are planning. Plus, all the printable templates we are including this curated list are available as Microsoft Word template files. This means that you may easily open and edit the template as long as you have the word processing software program Microsoft Word installed on your computer or laptop. Check out the different sample invitation card templates below. What are Blank Invitation Cards and How to Create Them? As most people know, invitation cards are used to formally invite a person or a group of people to an event, party, or celebration. These cards are usually printed on high-quality paper or cardstock. They come in various shapes and sizes depending on the preferences of the card creator. Also, invitation cards can now be sent electronically. E-cards or electronic invitation cards are usually sent through email and are formatted just like a regular printed invitation card. 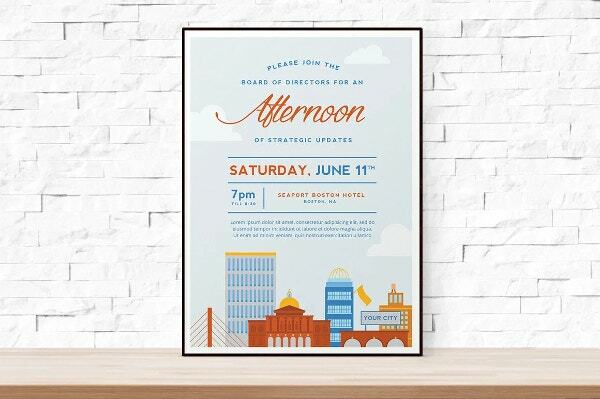 To create printed invitation cards, most people can choose between two card creation methods. The first invitation card creation method is by manually handcrafting an invitation card. This method relies on the cardmaker’s skill on craft-making since he or she will need to create handmade invitation card designs on his or her own. Using handmade card designs is perfect for those who want total control over how their invitation cards will look like. A downside of this approach is the amount of time it can take to manually create one invitation card. The second method is through the use of a pre-made digital template. With the second method, card-makers can further choose if they want to use Illustrator templates, Photoshop templates, JPEG templates, or even Microsoft Word templates. These digital templates are pre-formatted with images, text, and other design elements that are needed to create a graphic design template that follows a cohesive design theme. Most people prefer this approach to invitation card-making if they are pressed for time and just want to ready to print card template. Each card creation method has its own pros and cons. For example, handmade invitation card designs can be good to showcase your creativity but they can be troublesome to create if you are planning a big party with a lot of guests to invite and create invitation cards for. Pre-made invitation card designs are perfect for those who are on-the-go but these invitation cards may sport cover designs that have often been used by other people. So if you are creating a printable invitation card for your event, make sure that you carefully weigh in all these factors. When done right, you will surely have an invitation card created according to your personal preferences and you wouldn’t have it any other way. Why Use Blank Invitation Card MS Word Templates? For those who are still on the fence whether to use blank invitation card templates in Microsoft Word format or not, we have listed the top reasons why you should. Read each benefit carefully and you will soon realize the multiple advantages that using these templates will bring you. One of the most appreciated advantages of using blank party invitation card templates in MS Word format is that they are often a lot cheaper compared to other card templates in other formats. To illustrate, Microsoft Word is a software program that almost everyone with a personal computer has access to. And, in effect, templates created using Microsoft Word is a lot more common and will, inevitably, cost a lot less. So if you have a limited party budget, using a Microsoft Word template file for your blank invitation cards may be a good way for you to save money. Aside from their affordability, blank invitation card templates in MS Word format are relatively easy to edit. Remember, Microsoft Word is a staple software program for most personal computers. This means that most of those who have PCs will also know how to use and edit using Microsoft Word. So if you are using a blank invitation card template in MS Word format, it will be relatively easier for you to edit the entire card template. It’s true that the editing options available in Microsoft Word are not that extensive. But still, they can suffice if you just want to add a little personal touch to your invitation card design. If you are interested in learning other more advanced graphic design software programs, you can learn by checking out these free online Photoshop tutorials and Illustrator tutorials. When you use pre-made blank invitation card templates, you can choose the template that was created on the printing size of your choice. 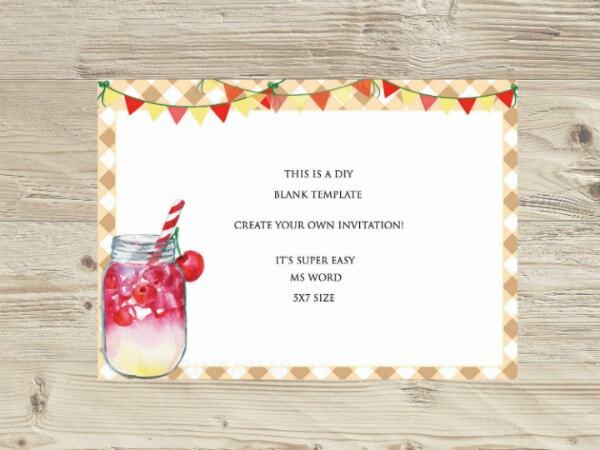 For instance, if you want your birthday party invitation cards to follow an A4 flyer size, you can choose a pre-made invitation card template that is specifically formatted for an A4 printing size. Having this option to choose your invitation card’s printing size can be very convenient and will help you avoid any issues with your printer or print shop. 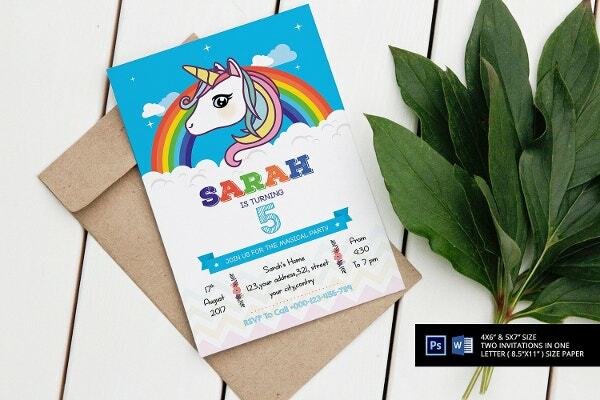 Also, if you prefer to follow a custom-sized card printing, you can arrange this beforehand with your print shop since you already know that your pre-made invitation card template is already available in the printing size or format of your choice. Doing this will not only make our life easier but it will also lessen the work of your print shop personnel since they do not have to optimize the invitation card template on their end. you may also see create invitation cards. As we have mentioned above, blank invitation card templates are ready to print. This is especially true if you just want to print the blank invitation card templates right away and only write down the invitees’ names after the card has been printed. So if you are pressed for time in creating well-designed blank birthday invitation for an upcoming event, you can readily download an invitation card MS Word template online and print it out right away. All these templates have already been pre-formatted so you will not have much of an issue when it comes to printing them. 5. 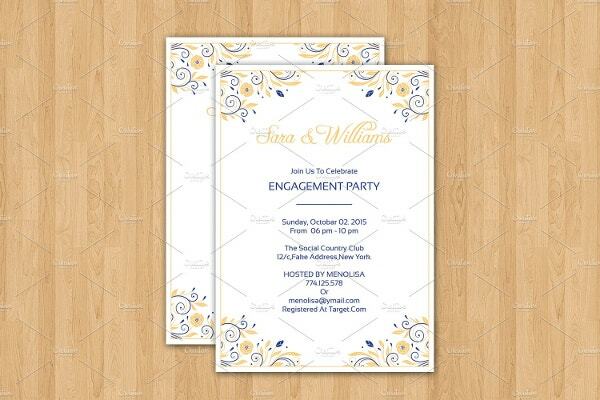 Blank invitation card templates are reusable. One of the best advantages of using blank invitation card templates is their reusability. Remember that invitation card templates are still digital template files. You may download, edit, and save these template files in your computer or in any storage device and retrieve them again for later use. What’s great is that you can use a blank birthday invitation card in MS Word format to create the party invitations for your child this year and you can use this same blank birthday invitation card template again for another child’s birthday party. In simpler terms, you can still access your chosen blank invitation card template without paying for it again. And since these pre-made invitation card templates are relatively easy to edit, those two invitation cards will not look the same at all. The possibilities are endless when it comes to reusing your sample invitation card Word templates. Remember that these card templates are basically blank slates. You can do whatever you want with them and still end up with something truly unique as your invitation card. 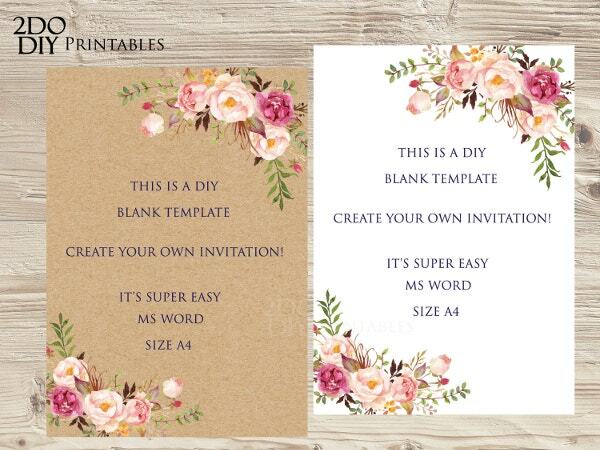 Have You Chosen a Blank Invitation Card MS Word Template? This article is filled with examples of blank invitation cards in Microsoft Word template format. 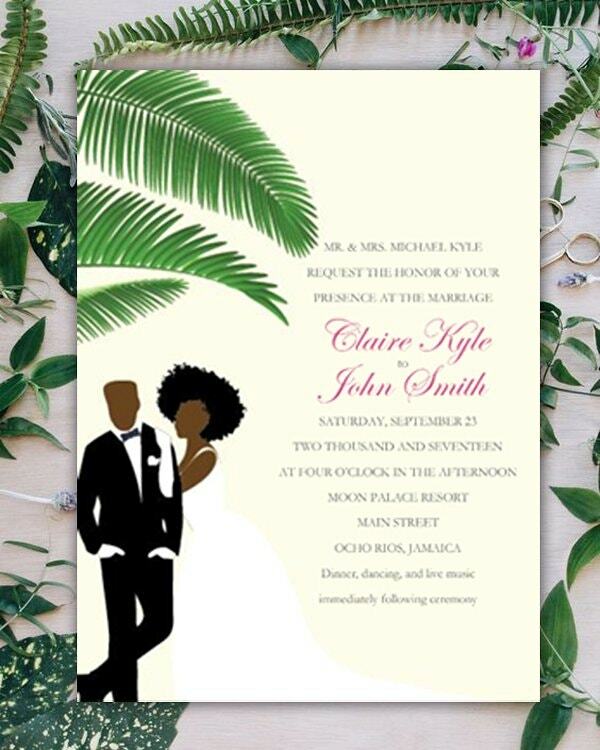 You only need to know how to use Microsoft Word and editing these invitation card templates will be a breeze for you. If you are not familiar with Microsoft Word, then perhaps it is time for you to get out of your comfort zone and begin learning by checking out different free tutorials online. Choose the invitation card template that best matches the theme or motif of the event or party you are planning. When done right, your invitation card will help pique the interests of the invitees and make them more excited to attend the event. For more information on how to create different kinds of invitation cards, check out the rest of our website. Also, do not forget to share this article with your email list (if you have one) and with your followers and friends on social media.